Firstly, you need to prepare a hole approximately twice the size of the roses roots. This hold should be about 18 inches away from the wall. Try to shape the base of the hole in such a way that it is about 45 degrees running away from the inside of the hole. Now place a generous amount of nice, rich mature manure mixed with soil in the base. Now place the rose in the centre of the hole and fill in the hole. There should be a mark of old soil on the rose so do not plant the rose so deep that you cannot see that line. This line/mark should be just above the surface. Now gently firm the soil in around the rose and give a good watering. Water well in the first year after planting, it is not as important in subsequent years once the rose is established as they are deep rooted plants. Now you need to place a series of horizontal wires secured to the wall at approximately 6 inches apart. Now you need to tie your climbing roses along the first one or two wires in a fan effect. 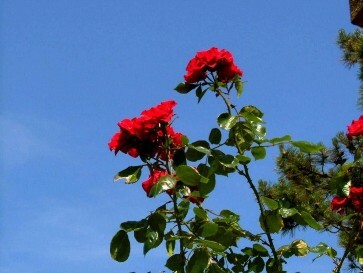 Doing this means that your rose shoots are kept horizontally and thus by nature the rose will send new shoots upwards. you then do the same with those. this means you get even and full coverage with on practically all of the area you are growing your climbing rose on. It also makes rose bush care maintenance easier. Planting roses as hedges can work very well in many gardens, especially if you are not looking for a very formal shaped hedge. Another advantage of this is the fact that the care of roses in a hedge is very little other than some deadheading of blooms and a touch of light pruning. As with any plants choosing the correct rose for the job is vital. Ideally when growing roses as a hedge you want to look for the following qualities, hardy, disease resistant, plentiful and continuous blooms with lots of foliage. For a small hedge you will be single row planting at about 10 inches apart. The best types of roses for this job are patio rose types or dwarf floribunda type roses, these will grow to about 30 inches tall. If you want to grow a medium sized rose hedge of about 5 feet tall you could choose Hybrid Teas, Floribunda Type Roses or Shrub Roses. If you desire a tall rose hedge, i.e. over 5 feet tall, use shrub roses or tall floribunda type roses. Plant these roses in a straight line about 3 feet apart. Suitable types of roses for this purpose are Chinatown, Scabrosa, Rosa Rugosa Alba, Penelope, Roseraie de l’Hay. The bed of roses as an island surrounded by well tended lawns is a classic scene that has lost none of its appeal over the years. If this method of growing roses is something that appeals to you there are somethings you should consider. For the most dramatic effect when growing roses this way, choose one colour, the bigger the rose bed the bigger you will need your roses, this is especially the case if you want to enjoy some of that color from a distance. If the bed is going to be particularly large you should consider some standard roses or tall roses for planting in the middle. This gives height to the bed and the tiered effect still leaves the shorter roses on the outside more visible. 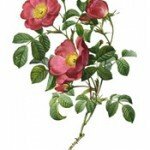 When looking at the different types of roses for this situation there are some guidelines that you should follow. 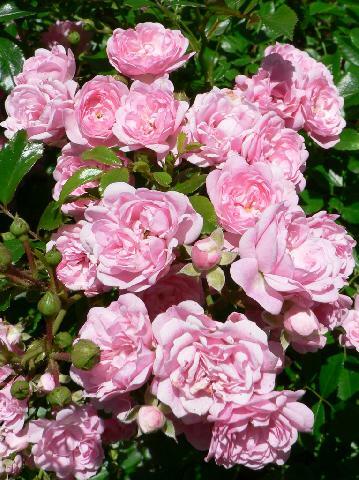 Roses need to be repeat and heavy flowering and in quick succession. They need to have plenty of foliage and a good spread of blooms. They should be able to deal with cold weather. They should be able to deal with wet weather. Even with smaller rose beds you will need a certain amount of room not just for the rose to grow but also for you to be able to work in around it and possibly underplant it if you wanted to. Make the bed at least 5 feet wide. To provide full coverage from all angles, stagger your roses when you are planting them. This really cuts down on any possible bare spots. Growing roses in borders opens up a world of opportunities for dramatic effects and colour co-ordination. In general borders are ares of a garden that are only accessible from one side, for example a border grown along a wall. However, you can have borders along your driveway and/or lawns. Growing roses in borders along walls, sheds and other structures is usually an informal planting scheme. The taller plants including the roses are planted to the back with the other plants generally decreasing in size as they go to the front of the border. It is also a great opportunity to start growing climbing roses and rambling roses, in fact it is a great opportunity, if your border is large enough, to try out several different types of roses. Firstly make sure you have allowed enough room for the eventual size of all plants once they reach maturity. Use Floribunda type roses and then climbers and ramblers to do exactly as their name suggest, you could even place small arches or other structures with your bed to highlight these roses and add even more dramatic effect. 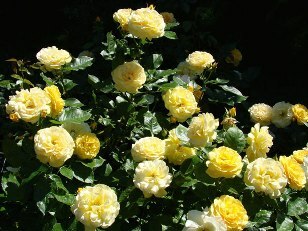 If you choose the lighter pastel colored roses, shrubs with grey leaves work brilliantly with pastel colored rose types. Evergreen plants with a distinct shape such as conifers are ideal to create a backbone or skeleton to the border. Underplant your roses with possibly bulbs or smaller evergreen plants to provide some colour when the roses are not in bloom.